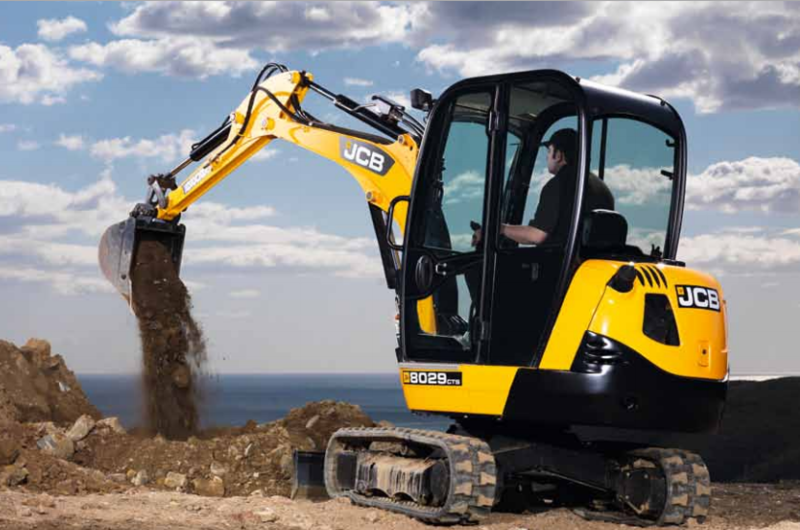 JCB has designed its compact excavator range to incorporate five key characteristics: comfort, controllability, reliability, serviceability and performance. 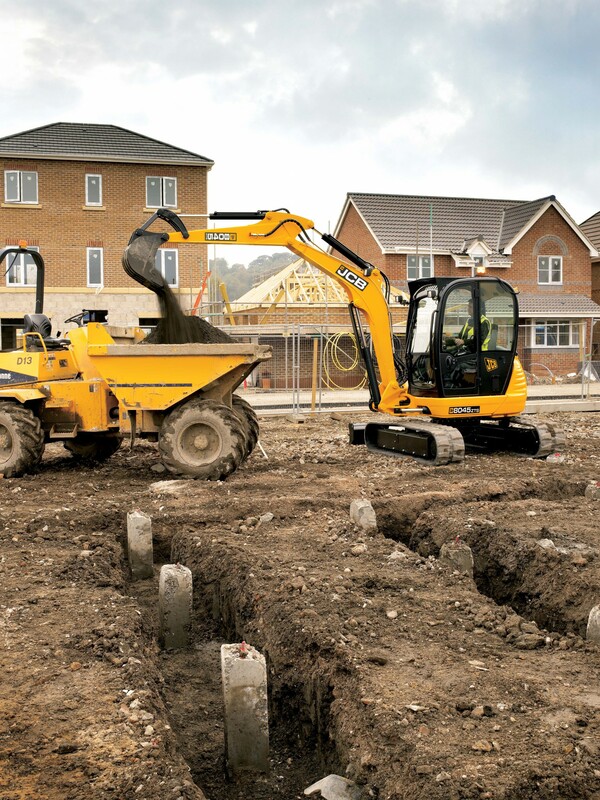 JCB compact excavators excel in all these areas. Our 8018 and 8029 compact excavator models provide precision control, unrivaled service access and an exceptional operator environment. All in a compact package that’s easy to transport and ideal for size restricted jobsites. Meanwhile our 8035, 48Z, 55Z, 85Z and 90Z zero tailswing compact excavators address the need for compact machines that are quick, powerful and productive. Easy-to-operate and control, a ZTS compact excavator bears serious consideration, particularly when it comes to stability and power. The 57C,67C, 86C and 100C offer the same high performance with minimal tail swing. The JCB compact excavator range offers a multitude of machines that are indispensable across a whole host of applications and sites. 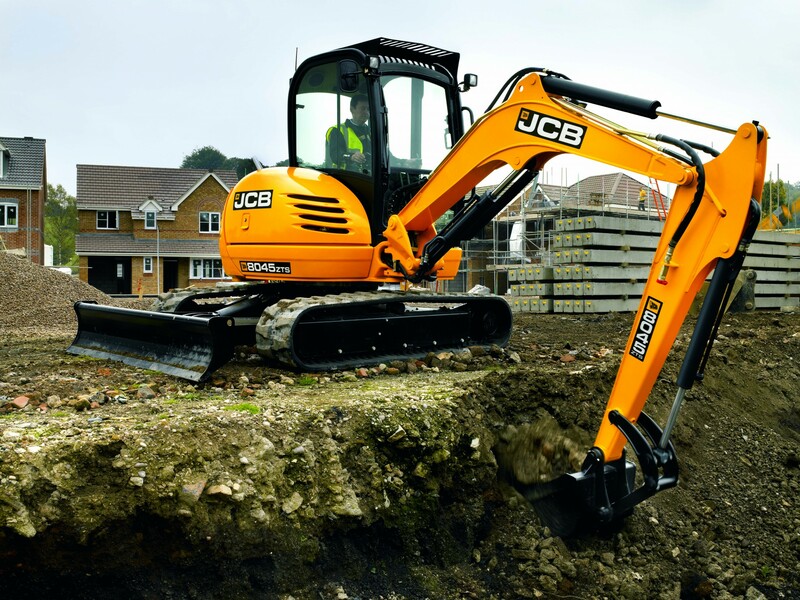 If you’re looking for the ultimate mini excavator, look no further than the JCB 8018 CTS. It boasts best-in-class performance, allied to incredible build quality, superlative strength and unbeatable ease of operation. We’ve used the very latest manufacturing and design processes to create this highly advanced conventional tailswing machine. As such, it boasts everything from a potent engine to a strong dozer blade, durable steel bushes, an extending undercarriage, low weight and a new high-precision hydraulic valve block. Adjustable wear pads on the track extensions provide a long service life and a firm, positive, quiet ride during tracking. The high-strength box section dozer blade can withstand impacts from kerbs and man hole covers, while dozer blade hoses are protected by a steel plate. JCB’s state-of-the-art manufacturing processes achieve ultimate build quality, reliability, durability, service life and machine uptime. Our in-house paint process is a case in point, guaranteeing quality and lasting protection. To optimize durability and service life, we’ve fitted replaceable steel bushes to the kingpost, dipper nose and bucket tipping link. This also provides smooth and accurate operation. Our latest low-wear steel bushes are highly durable and also reduce wear on pivot pins. Because the 8018 CTS weighs just 1822kg, it can be easily towed to wherever you need it. We’ve grouped all daily service points to make servicing quick and easy. Wide-opening service access panels are supported with gas struts for excellent access to routine checks. JCB’s impact protection front screen shields the operator from flying debris when using breakers. The short pitched tracks engage every tooth on the sprocket for less vibration and noise, and a far smoother ride. A large glass area and low hood profile provide excellent all-round visibility, including to the front right-hand track. This means the 8018 CTS doesn’t need mirrors to meet EU regulations. 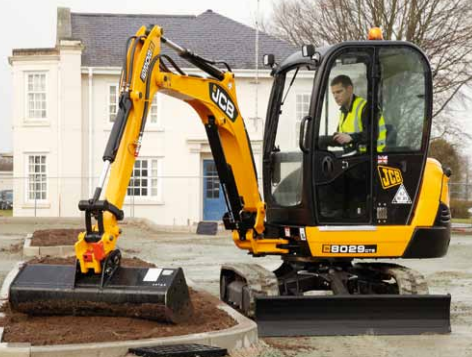 JCB designs its mini excavators to be highly efficient. Clever weight distribution has minimized counterweighting for a less stressed engine. Productivity is also helped by the spacious, comfy cabs we’ve fitted. Easy maintenance and rugged components come as standard too, which helps efficiency. The brand new JCB 8029 CTS mini excavator is our first-ever conventional tailswing machine in the current 2.5-3.5 ton class. With a transport weight of 2.7 tons, it’s one of the largest excavators you can tow behind a 3.5 ton vehicle. It’s similar in many ways to our 8025, but it’s been uprated in key areas. motor that delivers 21581lbf (96kN) of torque at 1800rpm. A tailswing of 1ft 5in (470mm) more than the 8025 ZTS, combined with a very low center of gravity, provides a 19% greater lift capacity than the market leader. At the 8029 CTS compact excavator’s dig end, our box-fabricated boom and dipper is capable of 8ft 9in (2.74m) dig depth, 15ft 6in (4.77m) reach and 10ft 5in (3.22m) dump height. Excellent bucket rotation and class-leading tear-out forces mean great productivity. Versatility-wise, you can easily attach hammers, compactor plates and more. A brand new undercarriage, meanwhile, uses 3 bottom rollers, 1 top roller, plus heavy duty track idler guides and grease tensioners. All of which is just the beginning of the JCB 8026 CTS mini excavator’s benefits. Just like our 8025, the new JCB 8029 CTS mini excavator is designed to meet customer demands for unrivaled service access and long 500-hour service intervals. Externally, there’s now a robust black cast counterweight to protect the rear and we’ve lowered the turret height by 1.3in (35mm) for added stability. We’ve also improved the tracks on the 8026 CTS JCB mini digger. 9.8in (250mm) Bridgestone short pitch tracks reduce noise and vibration, and are highly durable. Single side grease points on the excavator arm pivot pins simplify greasing. Then there’s excellent access to the hydraulic valve block under the side-opening hood, plus we’ve used the latest O-ring face seals throughout this compact excavator’s hydraulic system for durability. The two gas assisted gull wing bonnets give excellent engine access. On the 8029 CTS, there are Nachi auto kickdown motors for smoother operation when spin turning and dozing. Tracking speed and single speed tractive effort are therefore class-leading, at 3mph (5kph) (11% improved over the 8025) and 5624lb (25.02kN) respectively. For lifting power to match, we’ve fitted a Maxi-lift dozer ram to this JCB mini digger. You can actually lift the front of the machine on the dozer even at engine tickover, at maximum reach with a 1697lb (770kg) load. This is unique to our machine. The 8029 CTS compact excavator also features our new EV31 hydraulic valve block, which gives 4 major benefits. Longer spools mean smoother controllability; load hold capability is increased; multifunctioning can be carried out while straight line tracking; and there’s full control isolation over all hydraulic services. To save fuel, the 8029 CTS uses a lower power version of the 8025’s engine (torque is equal) but, because of our other innovations, productivity is still class-leading. That represents a 8% efficiency gain. Unusually for a mini excavator, there’s plenty of room in the 8029 CTS’ cab. Access is easy via a wide door, and the door itself latches back within the tailswing so you can work with it open. To make access to this JCB mini digger even easier, the left control pod hinges up and there’s no left foot pedal to get in the way. There’s more leg room, a further 1.9 in (50mm) of seat adjustment and improved cab storage over the 8025. Not only that but new rubber cab mounts reduce vibration, and internal noise is just 77 dBa. The seating position is fully adjustable for maximum comfort and there’s an efficient heating system. You can effortlessly store the gas-strut-assisted upper front screen overhead, and the lower front screen can also be removed. Plus, the whole cab structure is isolated from the slew frame for minimum vibration. In all, the JCB 8029 CTS compact excavator is a comfortable favorite. 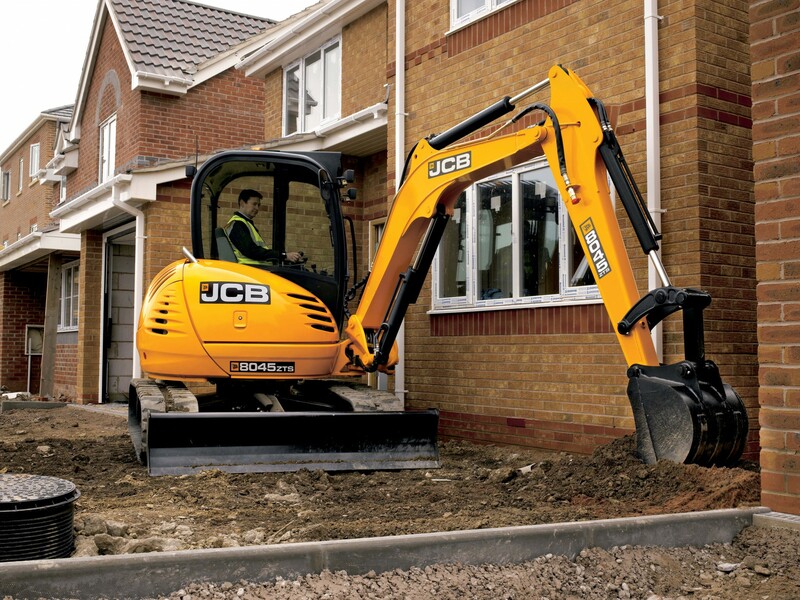 The JCB 8029 CTS is an exceptionally efficient mini excavator. Up to 8% more efficient than our 8025 machine, with 19% greater lift capacity than the market leader, productivity is second to none. Especially with our new EV31 hydraulic block and an 11% faster tracking speed than the 8025. The JCB 8035 ZTS mid-sized mini excavator is a true zero tailswing machine offering everything that a conventional tailswing does, with a larger undercarriage. In direct response to customer demands, the JCB 8035 ZTS mini excavator boasts unrivalled service access and long 500-hour service intervals. You can check the oil from ground level, and the fuel filter system features a combined sedimenter, filter and primer which allows you to prime the system if it runs out of fuel. You can change the filter without any extra tools and, under the rear cover; a large capacity moulded fuel tank means longer working hours and greater productivity. 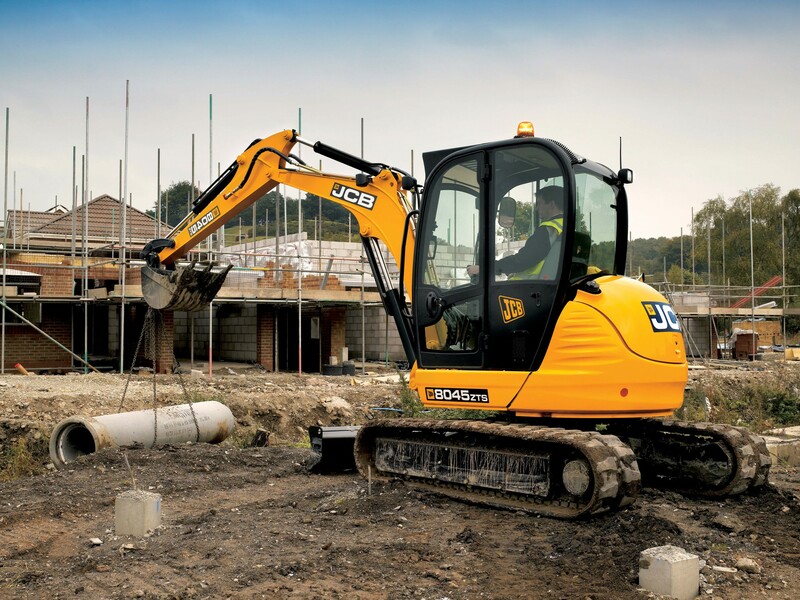 The JCB mini excavator range is designed with comfort and ergonomics to the fore. On the 8035 ZTS, a changeover button on the joystick lets you switch the right pedal between auxiliary service and boom offset function. In boom offset mode, you can operate the slew of the upper structure and the boom at the same time, allowing you to get this JCB mini digger into the correct position straight away. Plus this foot pedal is servo operated for low-effort, precise control. Whether you choose the cab or canopy option for your 8035 ZTS compact excavator, you’ll find visibility is excellent. To the left, you can see the whole track. To the right and the rear, the curving bonnet bestows a clear view. We’ve also mounted the hoses on top of the boom to aid visibility still further. Zero tailswing mini excavator cabs are traditionally cramped workplaces. 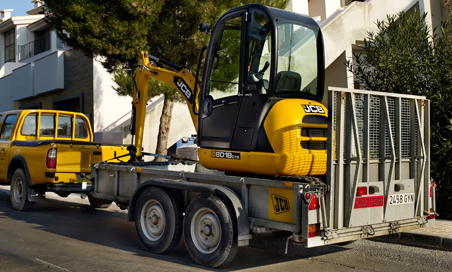 However, JCB’s range is unique in offering a spacious, comfortable operator environment. The seating position is fully adjustable for maximum comfort and there’s an efficient heating system. You can effortlessly store the gas-strut-assisted upper front screen overhead, and the lower front windshield can also be removed. Plus, the whole cab structure is isolated from the slew frame for minimum vibration. In all, the JCB 8035 ZTS compact excavator is a comfortable favorite. The JCB 8040 ZTS mini excavator weighs 9480lb (4300kg) and is powered by a Perkins 45hp (34kW) engine, making it one of the most powerful machines in its class. tractive effort and impressive tracking speeds. This JCB mini digger achieves its high performance because good weight distribution makes it very stable and the X-frame undercarriage dimensions make maneuvering easy. The 8040 ZTS compact excavator also boasts a smooth ride and excellent tractive effort. Two-speed track motors provide high tracking speeds and a curved dozer profile prevents material build-up. The 8040 ZTS mini excavator is rounded off by single-acting auxiliary pipework on the dipper for powering breaker attachments. In direct response to customer demands, the JCB 8040 ZTS mini excavator boasts unrivalled service access and long 500-hour service intervals. The 8040 ZTS compact excavator has side-by-side engine and hydraulic oil cooling packs for easy cleaning, and color-coded hydraulic hoses meet under the cab floor for simple access. On the 8040 ZTS, a changeover button on the joystick lets you switch the right pedal between auxiliary service and boom offset function. In boom offset mode, you can operate the slew of the upper structure and the boom at the same time, allowing you to get this JCB mini digger into the correct position straight away. Plus this foot pedal is servo operated for low-effort, precise control. 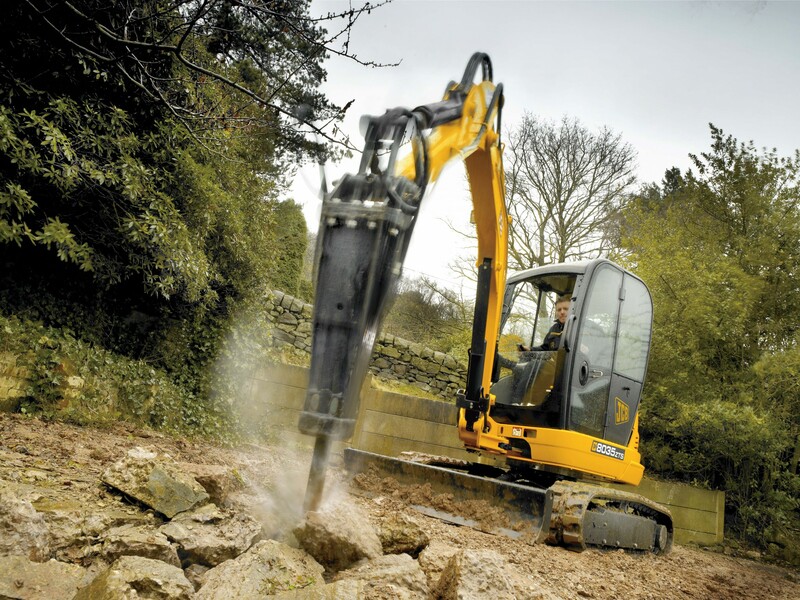 What’s more, the 8040 ZTS compact excavator comes with auto-idle as standard. That means that the machine automatically starts in idle mode and automatically switches to idle when stationary, protecting the engine and the operator. The feature can easily be disabled too. The 8040 ZTS mini excavator’s load-sensed flow-on-demand hydraulic system automatically controls flow and pressure, saving fuel. The seating position is fully adjustable and, when you adjust the seat, the control pod adjusts too (although the two can be adjusted independently). There’s also a heater as standard. You can effortlessly store the gas-strut-assisted upper front screen overhead, and the lower front screen can also be removed. Plus, the whole cab structure is isolated from the slew frame for minimum vibration. 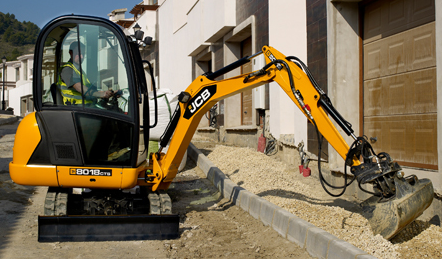 In all, the JCB 8040 ZTS compact excavator is a comfortable favorite. 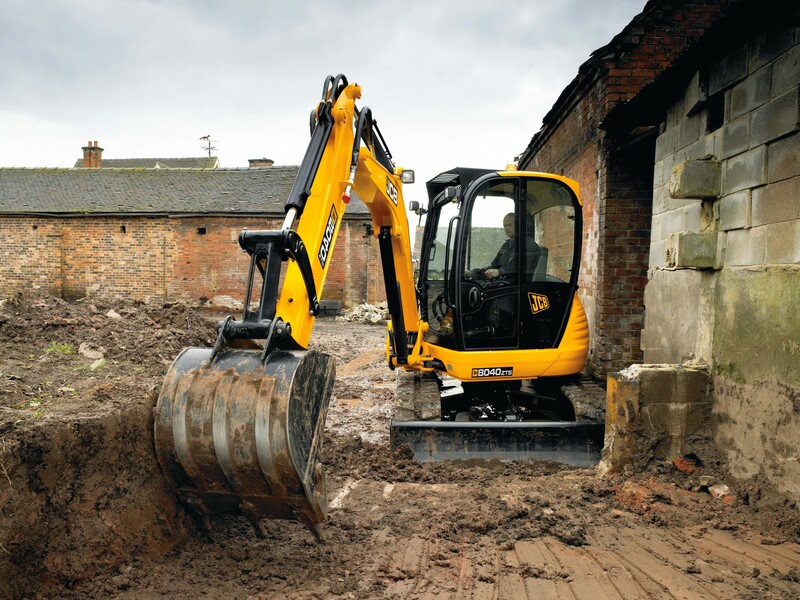 JCB designs its mini excavators to be highly efficient. A load-sensed, flow-on-demand hydraulic system only provides hydraulic oil only when you need it, saving you fuel. Productivity is also helped by the spacious, comfy cabs we’ve fitted. Easy maintenance and rugged components come as standard too, which also helps efficiency. The JCB 8045 ZTS mini excavator weighs 10472lb (4750kg) and is powered by a Perkins 45hp (34kW) engine, making it one of the most powerful machines in its class. That power is translated into superb digging and tracking performance by a load-sensed hydraulic system, providing big breakout forces, high tractive effort and impressive tracking speeds. This JCB mini digger achieves its high performance because good weight distribution makes it very stable and the X-frame undercarriage dimensions make maneuvering easy. The 8045 ZTS compact excavator also boasts a smooth ride and excellent tractive effort. Two-speed track motors provide high tracking speeds and a curved dozer profile prevents material build-up. The 8045 ZTS mini excavator is rounded off by single-acting auxiliary pipework on the dipper for powering breaker attachments. In direct response to customer demands, the JCB 8045 ZTS mini excavator boasts unrivalled service access and long 500-hour service intervals. The 8045 ZTS compact excavator has side-by-side engine and hydraulic oil cooling packs for easy cleaning, and color-coded hydraulic hoses meet under the cab floor for simple access. On the 8045 ZTS, a changeover button on the joystick lets you switch the right pedal between auxiliary service and boom offset function. In boom offset mode, you can operate the slew of the upper structure and the boom at the same time, allowing you to get this JCB mini digger into the correct position straight away. Plus this foot pedal is servo operated for low-effort, precise control. What’s more, the 8045 ZTS compact excavator comes with auto-idle as standard. That means that the machine automatically starts in idle mode and automatically switches to idle when stationary, protecting the engine and the operator. The feature can easily be disabled too. The 8045 ZTS mini excavator’s load-sensed flow-on-demand hydraulic system automatically controls flow and pressure, saving fuel. You can effortlessly store the gas-strut-assisted upper front screen overhead, and the lower front windshield can also be removed. Plus, the whole cab structure is isolated from the slew frame for minimum vibration. 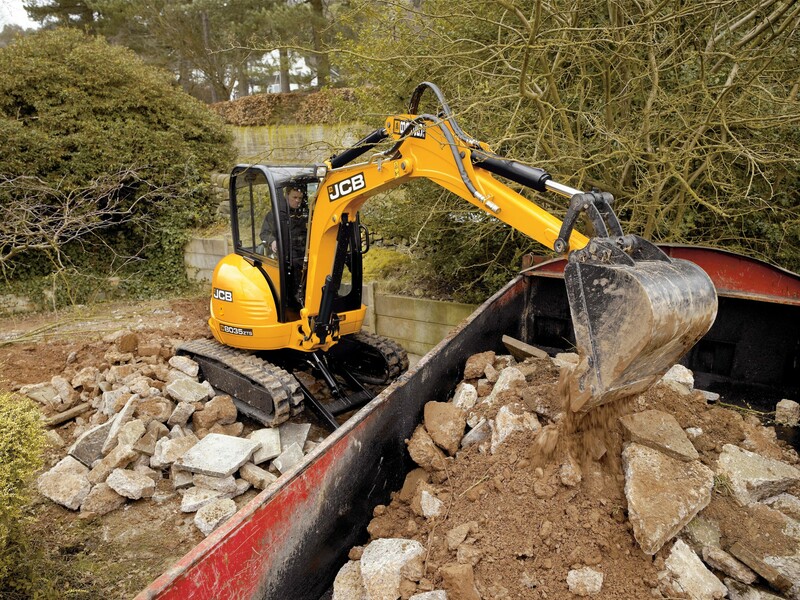 In all, the JCB 8045 ZTS compact excavator is a comfortable favorite. The JCB 8055 offers superb levels of power for its class of excavator. Featuring a highly efficient Tier 4i Isuzu 4LE-1NA 45.7hp (34.1kW) engine, it has an excellent working capacity. It weighs 11,600lb (5300kg). Two-speed track motors provide high tracking speeds and auto kickdown provides optimal travel speeds. Our midi excavators also feature a curved dozer profile and superior tractive effort for great performance. All of which is built on an X-frame undercarriage for exceptional rigidity and stability. Each JCB midi excavator has superb build quality, with a robust undercarriage and superstructure designed for maximum reliability and minimum downtime. Hoses are routed on top of the booms of our midi excavators for damage protection, while auxiliary pipework features quick-release couplers to prevent oil leaks when connecting attachments. JCB’s twin speed track motors (manual or automatic) and associated hoses are completely enclosed inside the undercarriage to guard from damage. What’s more, a sloped track frame encourages dirt to slide off, preventing potentially problematic build-up. Even routine servicing is made easier on a JCB midi excavator; all our midis now offer unrivalled service access (much of it grouped, from the ground) and long 500-hour engine service intervals. On all our midi excavators, proportional servo controls allow precise metering of the bucket; lever efforts are light and operator positioning is ergonomic. A load-sensed, flow-on-demand hydraulic system controls flow and pressure, providing hydraulic oil only when you need it. That, in turn, keeps the engine at peak efficiency, saving you fuel. Plus, because the system shares oil equally, all services can be supplied (and keep working) without starving any one function. An additional benefit of load-sensed hydraulics is straight-line tracking, which makes our midi excavators great for positioning next to obstacles or loading/unloading. The JCB midi excavator range is designed around the operator. After all, a comfortable operator is a productive one. We start by ensuring that control is ergonomic, intuitive and low effort. Inside the 8055 RTS, the cab is very large and accessible compared to most zero tailswing machines. The seating position is fully adjustable for maximum comfort and the whole cab structure is isolated from the slew frame for minimum vibration. In all, the JCB 8055 RTS compact excavator is a comfortable favorite. 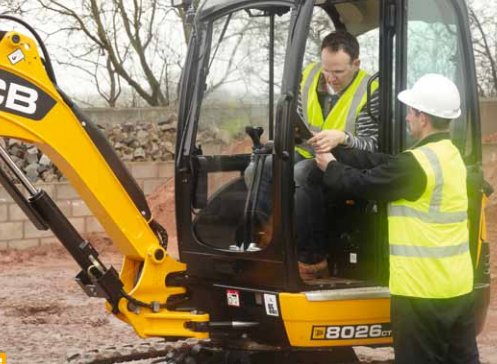 JCB designs its midi excavators to be highly efficient. A load-sensed, flow-on-demand only provides hydraulic oil only when you need it, saving you fuel. Productivity is also helped by the spacious, comfy cabs we’ve fitted. Easy maintenance and rugged components come as standard too, which also helps efficiency.